This week, France began pulling approximately 2,100 combat troops out of Afghanistan in a surprising early retreat. NATO expected France’s full commitment until 2014. “Today is the end of our forward operations. By the end of the year, we will have 1,500 French troops remaining in Afghanistan in non-combat operations,” said Lt. Col Guillaume Leroy (Reuters Nov. 20, 2012). Those non-combat jobs include supply logistics as well as training operations for Afghanistan’s army, which is scheduled to take control of its country’s situation in 2014, after NATO troops make their way out. Francois Hollande defeated French President Nicolas Sarkozy in a presidential runoff in 2012 and promised to help dig France, and Europe, out of a weak economy (CNN Wire May 6, 2012). Exiting the fight is a solution for a floundering French economy, not to mention a classically defeatist French military move. But perhaps the United States under President Obama should follow suit. It might help the US economy. Originally Posted by demopublicanBush and Powell’s wars have been a huge drain on the world’s economy and have cost far too many lives. Ah Bush has not been President for four years. Obama has not only continued the US presence there but drastically increased troop numbers. How long does he, have to be President before Afghanistan becomes, his war? Now if we could just follow the French’s lead. Osamma bin Laden gone? Check. Though I suppose we’ll be out of there just like were out of Germany, Japan, Korea and Iraq. The announcement of early French withdrawal from combat operations in Afghanistan brings to my mind another United States initiative that needs closure due to serious moral and financial questionability: Gitmo. President Obama, now in his fifth year as Commander in Chief, still has not closed Guantanamo Bay Prison – an issue he campaigned on in 2008. Why not? No doubt the politics of fear are complex and shadowy, but a careful plan for evacuating all of the prisoners was never completed by the bureaucratic task force established to review such a process. Even though President Obama does not want to be seen as being soft on terrorism he should still close Guantanamo Bay Prison. It would be a major step and graceful beginning to winding down wartime activity in Afghanistan. Furthermore, if President Obama takes the cue from its NATO counterpart France to withdraw sooner, I might be the first time an American President has taken political cues from France since the US’s founding fathers did so in the late 1700s. My last blog, France surrenders to Neo-classicism, was written in a tone which mocked the stuffy resistance many French citizens have against an increasingly modern style which is encroaching upon art and architecture in French cities. A pervasive notion, the average Frenchman is a staunch supporter of defending a distinctly French cultural identity that conveys only the most classic elements. To this end, the French are willing to constantly revolt, often taking to the streets en masse to protest unpatriotic top-down political decisions and business decisions, as well as any undesirable international influence. In this blog I aim to connect some major (and very French) concepts – l’exception culturelle, the emphasis on France’s social model, their views on what public services should be, and their sense of entitlement to irrevocable benefits – which underlie the average Frenchman’s motivation to demonstrate against change in the way they do. In the process, I hope to demystify some things that Americans find odd about French politics and culture. Background: Participants in the 1789 French Revolution violently discarded the long-standing and often-abusive French monarchy, and made liberty something to proclaim from the rooftops. This set the precedent which encourages the French today to be coup d’etat-crazy, capturing the state when necessary to defend human rights. The social and political commentator Montesquieu precipitated the Frech Revolution in the mid-1700s after he articulated “separation of powers” and insisted on a careful balance that would not threaten the freedom of the people. James Madison and the United States Constitution’s founding fathers adopted this principle, so Americans relate to it as it is an inherent part of effective democracy. L’exception culturelle francaise, the French cultural exception, was developed through democratic France’s formative years to describe “resistance to the perceived effacement of French culture and criticism of supposedly foreign intrusions within that culture” (definition from a 2006 UCLA conference that was held about the topic). Some examples of outrage over public defiance of this cultural principle in modern art and architecture are detailed in my earlier blog post, entitled “France surrenders to Neo-classicism.” L’exception culturelle francaise of has pervaded French cultural output since the 1789 Revolution, as witnessed in numerous episodes of loud public outcry and subsequent government policymaking that effectively “kept it in the family” whenever concerns arose pertaining to dilution of the French arts by foreign influence. But how strongly the concept influences French business output is apparent in the high degree of sensitivity to nationalism displayed by French businesses in making trans-national decisions in today’s increasingly globalized market, so that the Frenchness of production is not diminished. The concept of l’exception culturelle francaise is thus deeply patriotic, and is relatable to Americans’ outrage over things like corporate outsourcing of labor, and to the government bailout of financially irresponsible institutions. In France, players who don’t keep it French risk domestic backlash and revolutionary peril, the threat of which is apparently greater than that leveraged in America, as with the recent and failed Occupy Wall Street movement. It should be noted here that one source of anti-American sentiment originates from the general French disapproval of American hegemony (where Federal Law trumps State Law). That being said, Americans should appreciate the regularity of French riots and strikes as they preserve ideals of nationalism and democracy, like in the history of America, and they prevent the phasing out and replacement of quality domestic market goods and services with cheaper foreign ones. Lastly, it is important to recognize the idyllic motivation with which the protesting Frenchman goes about exercising their voice. To illustrate the motivations on an individual level, I present three related concepts which are not as prevalent in America as in France – 1) the French social model, 2) the French view on public services, and 3) their idea of irrevocable benefits. 1) The “modèle social français” is such that basically everybody on the political Left as well as many on the political Right are accustomed to free or moderately-priced public services like healthcare, education, a higher compensation for unemployed people, a minimum income for all, and some prices depending on income, as with utilities, school, public transport, swimming pools, and others. The French generally think it is more important to protect the weakest than to encourage the strongest, which sets them apart from the often isolating American concept of self-sufficiency, individualism, and the American Dream. “Although very questionable now, this issue was decisive in the 2005 referendum on Europe: millions [in France] voted NO to protect the French society against what they considered a threat to the ‘modèle social’ by ‘the heartless Anglo-Saxon market economy’” (understandfrance.org). It is notable that the French pay significantly higher taxes than Americans so that public services are maintained. 2) French who defend public services believe that state-owned or state-run services should not try to maximize profits but should maximize the quantity or quality of service provided. This is unlike the American corporation which, defined as a person, displays characteristics of a psychopath. French service standards are largely upheld according to the satisfaction of end-users, not just by beneficiaries of monetary investment. 3) The concept of avantages acquis, irrevocable benefits, maintains that once any kind of advantage has been granted, it is considered unthinkable to suppress it, whatever the circumstances and the situation. “Reducing salaries or increasing labor time may happen but is extremely rare in France and it raises huge controversies; there is almost no example of workers accepting cuts in wages and unions refuse to sign any agreement of this kind: they prefer unemployment and the protection of the State” (understandfrance.org). The powerful leverage of a workers strike is thus more immediately acknowledged and workers are not expected to make concessions. Ergo, labor unions are not as strategically necessary to resolving labor issues in France as they are in the United States. The effect of these prevailing concepts is this: the French conduct labor strikes out of conservative principles and the voice of the people is usually acknowledged by the government or the respective French business. Resolution or revolution is the French way, as opposed to common coercion and placation practiced by American businesses. French people commonly support their fellow citizens in protest, and they are not led to immediate opposition from polarizing political parties, like in America. The most common illustration of French support and fellowship is seen during frequent transportation strikes in France, when average people have to walk to their workplaces yet still genuinely support the labor strikes. Resolution of issues has to maintain a distinct Frenchness in style, not subjugate citizens or dilute the culture, and at a minimum maintain the status quo…or else there will be a riot. When national pride causes French workers to forego formal negotiation processes, the democratic voice of the people is best exercised by force. Understanding these ideas at the core of French culture can help to demystify many French cultural and political viewpoints which may differ from America. The joke is found in the French paradox in business: “How do they manage to be the fourth or fifth economy in the world given the way they work and strike?” When French people are on the job, they’re really on it. French architectural firm Atelier Zündel Cristea (AZC), has proposed formal plans to build an inflatable trampoline bridge across the Seine River in Paris. AZC claims, “the bridge in Paris, allows us to locate an architectural reflection within the same realm of contemporary urban enjoyment.” And despite protests that the audacious modern design would be a blemish on classically-styled Paris, AZC’s bridge won an award in a 2012 design competition hosted by the progressive ArchTriumph competition series. The bridge is obviously unsafe and completely gaudy, but to award such bold new style is to evoke the essence of the revolutionary Frenchman. But to the French, there’s a bigger issue than public safety at stake. French citizens who support the classically-styled projection of their culture claim that allowing the construction of such modern-style architecture is offensive to the visage, or “face,” of France. Meanwhile, artists who are progressive and modern in their style continue to encroach upon the refined classicism of Paris. A closer look at the proposed architecture reveals that even some of the new designs are indeed respectful of the classic style’s definitions, parameters, and values. Oh! The French cultural identity! Viva la France!! For a perspective crash-course, classicism is defined by worldly ideas originating from antiquity which “primarily express and set standards for taste which the classicists seek to emulate”, that is “formal balance, clarity, manliness, and vigor in art”. Yes, manliness. Today, arts and sciences are still considered “Classical,” while modern movements overlap, which still see themselves as “aligned with light, space, sparseness of texture, and formal coherence.” (Wikipedia, Classicism). Refer to a related case, where the French have gone ham on matters of cultural identity: The French have formed prominent committees to investigate, regulate, define, and refine language and art as representations of their distinguished culture. They’re all about refinement in enrichment. The Académie française (French Academy), which is part of the French government, arose in 1635 during the height of classicism. The French Academy still wields the same authority today as it did upon its inception. Its members are known as “immortals.” As a statement, an ex officio member of the Academy is The French Association for Standardization. Also notably, the French Academy has a Law Commission permanently assigned to the Academy of Sciences. Contextually, it is important to credit Cardinal Richelieu with all of this, under French King Louis XIV, a.k.a. the Sun King. Louis XIV was the epitome of the absolute ruler, Hobbes’s Leviathan, and a great patron of the art. His most famous achievement was the building of the grand Versailles Palace, and, according to french philosopher Alexis de Tocqueville (1805-1859), is responsible for the French Revolution. Big time. So, by the 1970s the French Academy was tasked with ensuring that terminology within France, such as is found on labeling, in advertising, and in broadcasting, was Academy-approved French terminology. No new slang. But a complete overhaul of French language law in the 1990s brought about the creation of Paris’s General Commission of Terminology and Neologisms as a prominent new major player on the cultural enrichment scene. The Commission is tasked, in every department and profession in France, with the responsibility for keeping current the new day’s words, that is to say, “to establish an inventory of cases where it is desirable to complete the French vocabulary, taking into account the needs expressed.” So it’s the old Academy dueling with the new Commission. It’s a big job to “ensure harmonization and relevance” of your cultural legacy. There was a big fuss when the modern technological term “cloud computing“ arrived on the Commission’s agenda in October 2009. I’m saying, “Hey, Frenchies,” if language is making slow progress, go big through architecture. And they had best get to it! After all, one mustn’t forget how the French were slighted during the London 2012 Olympics, when The International Olympic Committee defended the sparse use of French, even though it was the official language of the Games. Ouch. What else is new? Returning commentary to the realm of architecture, recall there was a fit when the glass pyramid was added to the Louvre museum in Paris. The striking contrast of architectural styles speaks volumes, in itself, about the depth of the controversy surrounding it. Opponents claim it is too modern while proponents explain its classic virtue. The same arguments were made surrounding the construction of the Eiffel Tower in 1887. It is difficult to accurately gauge the existing support for the emergence of such audacious modern-classical architecture in a classically-dominated France, although news media coverage of new defiant art and architecture proposals has increased considerably in recent years. A recent example of efforts to preserve French influential progressive architecture comes from an American Atlantic Cities article, “France should Honor Le Corbusier like we honor Frank Lloyd Wright” (Oct 11, 2012. Atlantic Cities). Le Corbusier’s work should be in (United Nations Educational, Scientific and Cultural Organization) UNESCO’s World Heritage status so its influence on modern art and architecture is preserved. It’s that little bit of… “Je ne sais quoi?” the French selectively imbibe and exude which we are attracted to. The concern of the citizens in maintaining quality control over their established cultural benchmarks is as admirable a characteristic as the importance today placed on continuing to introduce new French ideas to the gauntlet today. It’s all about enrichment. The people will fight to ensure it. This influence is reflected on to architecture as an outlet of cultural expression in which the people have a vote, and is also the source of controversy surrounding progressive neo-classic artists. I love to see bold designs defining a new era in France while strict classicists squirm at the sight and toil over antiquated perspectives. Groups like UrbanFreeFlow and Freemouv display skill at international competitions, most recently this July in the French Alps and in August in Wisconsin, USA. Their talents have also been displayed in such recent films as 007 James Bond: Casino Royale and Jump Britain. 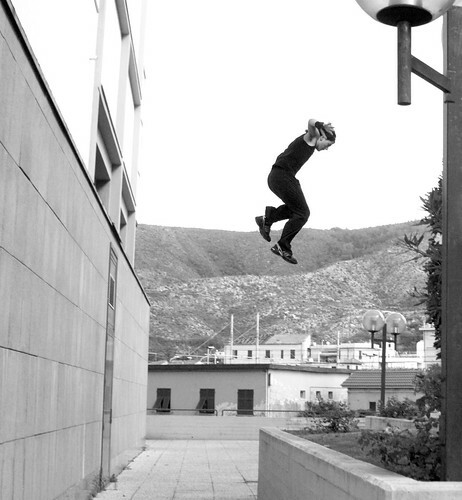 Foucan recently helped K-Swiss develop the Ariake, the first freerunning and parkour shoe. Nikon and GoPro have contests to sponsor amateurs in creating parkour videos for the web. Ultimately, parkour is for hard-chargers, fast runners, young kung fu masters, trapeze artists, and those kids who grew up having the most fun on the school playground. It continues to be rapidly embraced by a generation of unprecedented physicality and philosophy: a parkour generation.